Add buttermilk, and mix well. Keep- aside for 4-5 hours. Dissolve sodabicarb in the oil. Add to batter. Mix all ingredients except red chilli powder and coriander. Pour immediately in a 6″ diam. greased plate. 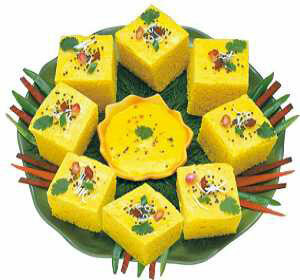 Cut dhaman dhokla into squares or diamonds and serve hot with coconut chutney.